Anyone remember the Lamborghini commercials with this "welcome to sant'Agata. home of Lambo' text? 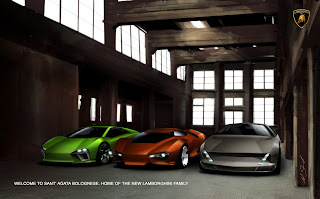 Well, to get some render-feeling back, I draw this picture of our three cool lambo models from the project. the left model is from my good friend johannes, the right one is from my other good friend fabs. the picture is completely drawn (except one wheel) in photoshop and took me just a whole day, but I'm really happy with the result. You're busted!! the police has arrived!